I spoke to my mom earlier this week. She said, in a 'nudge, nudge, wink, wink' kind of voice: "So, are you doing anything special this Saturday?" "No," I said. "Should I be?" "Come on, Spark," said my mom. "Think about it." And, oh yes, right you are mum, April 25th is our wedding anniversary! Ken and I would both have completely forgotten about it. Six years, and I don't know where they've flown. We figured that we'd splash out on one or two fun, unnecessary fashion items, as we have done many a time before. However, we did not have much luck at the discount mall. All the styles were either boring or just freaking crazy. Like acid-wash jogging jeans. They're more '80s than the '80s, and that's saying something. No thank you. I found a couple of items I liked, but the store didn't have them in my size. So they called the Yorkdale mall location. Yorkdale had my size. It wasn't far. So off we went to Yorkdale. Now, Yorkdale isn't a place that I do much shopping anymore. The ratio of high-end stores to... moderate-end? No. I guess: middle-of-the-price-range stores, is not conducive to my usual budget. They have a lot of real estate devoted to the likes of Versace, Burberry, Tiffany & Co., etc. ; places I normally ignore, because $$$$$$$$$. However, Ken said that he was feeling rich, and when he's feeling rich, watch out. The sky's the limit. I found a perfect little silver ring in Tiffany. It's like leaves! Just the thing for spring! I was happy. What a lovely anniversary gift. I was ready to call it a day. But Ken didn't feel finished. He wanted to poke around in the stores some more. So, just for fun, we started going into all the high-end places that usually aren't even on my radar. But Ken was feeling rich. 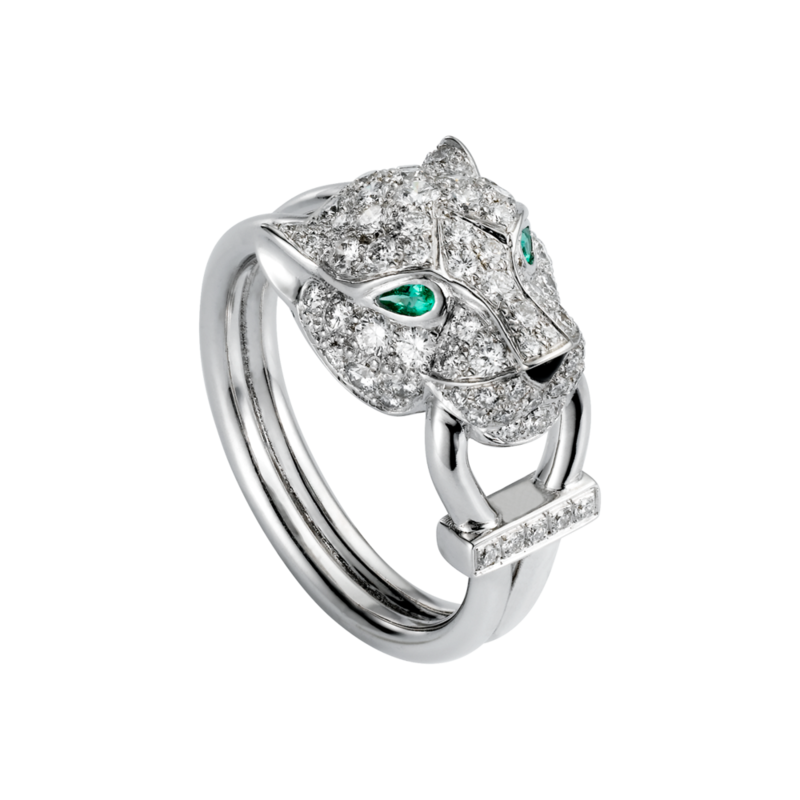 Now, I didn't walk away with this panther ring. Let's not get completely crazy! But when Ken decides to make a statement, he makes a statement. Check this out. It was wrapped for us while we sat in a fancy waiting area, sipping complementary beverages. Ken went with sparkling water, but I wanted to find out what type of coffee Cartier provides. I don't think I'll be able to sleep until next Thursday. Closed with real sealing wax, using the company's historic seal. It comes with a certificate, like a little passport. Alright, the wrapping is off. There's the box. Another box?! You're kidding me. I can't stand the suspense. That's more like it. Looks like a pendant on a gold chain. It is a pendant, mother of pearl with a diamond in the centre. How elegant! It looks very sweet, glowing and glinting in the light. I assure you that we do not do this type of thing for every anniversary. Given that I was brought up to believe that thrift and saving is a virtue, and spending shows weakness of character, it's a bit overwhelming to be so indulged in luxury. However, Ken would be quick to remind me that jewellery is also an investment, so it's not like we're spending our wealth never to see it again. We're just changing dollars into a much more compact (and gorgeous) format. Happiest of anniversaries, dear Spark. Many the Lord bless the many more you have to come. Jewely an investment—ha! Peggy used to take me to estate sales and talk me into going halves on jewelry for her by telling me that it was an investment. We’ve been married 43-years and she’s yet to sell her first piece. I really like both of the pieces you picked out. Very pretty. Happy Anniversary to both of you! Happy Anniversary!!! Glad Ken knows how to splurge for a lovely lady! Thanks Darc! My mom can always be counted on to keep track of important family dates. Snowbrush: Well, the idea is that we *could* cash them in if we *wanted* to. Unlike spending the same amount on a luxury cruise or something like that. However, I hope to never have to sell my jewels. My precious!!! Ron: Thankya! Ken is the king of the splurge. Very cool gift that Ken got you. That dainty little Tiffany leaf ring is really charming. How lovely! and how exciting! I am glad you had such a wonderful anniversary! Lovely and wonderful gifts! Happy anniversary! So pretty, Spark! Delicate and classy, much like the lady who now wears them. :D How awesome, too, to have a man who love you so much he finds you worth splurging on. That is truly a blessing! I remember when you got married, too. I didn't remember the exact date, but I remember reading your posts about it. :) Happiest of anniversaries to you both! May there be many more! Mazel Tov! The Fridge Report, No. 2 of ?